Sparked by a discussion on the NHRHTA Forum regarding New Haven's 44-tonners, here's some more information. You can see the builder's plate on the frame, centered under the cab in this photo of #0807. Photo taken by Ed Ozog at Charles Street Engine Yard, Providence, May 20, 1956. 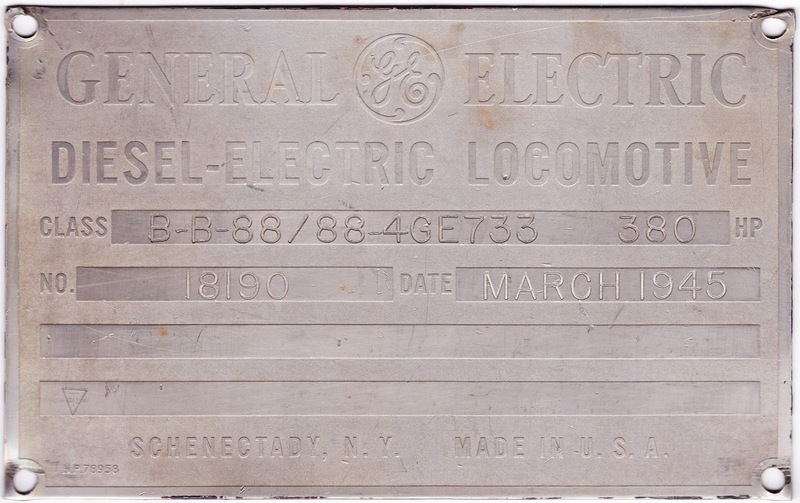 I might look into either 3D printing or photo-etching the builders plates. The Build Number and Date are listed on each one, but fortunately this information is available. 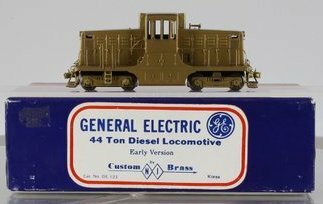 The New Haven rostered 4 variations of the GE 44-tonner. 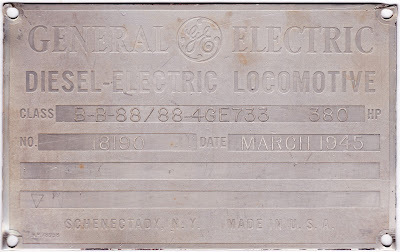 Note that the locomotive phases described here are from railroad historians, and not official designations of the builder, although they roughly correspond to different builder's drawings. To the best of my knowledge, the 44-tonner phases were designated by Don Dover in issue #51 (March/April 1975) of Extra 2200 South. He differentiates 5 phases with 10 sub-phases based on appearance. While the phases are mostly chronological, there are some overlaps. 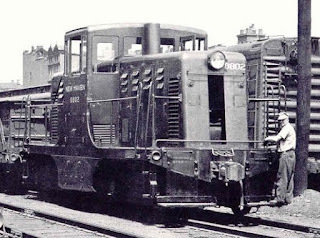 For example, the 9 Phase Ib locomotives were built during a period that overlaps the Phase Ia and the Phase Ic locomotives. 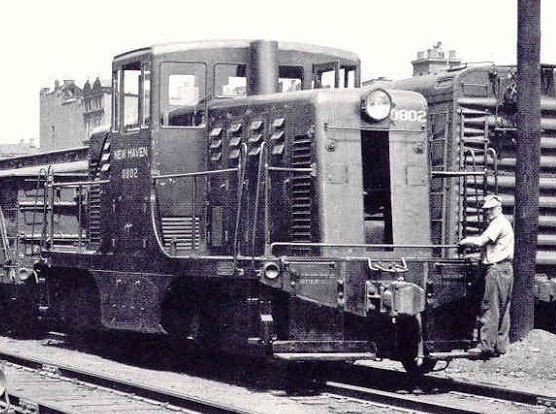 Phase IIb locomotives were built at the same time as the Phase IIa locomotives. This is the Custom Brass model, a prototype photo of #0800 is in New Haven Power. The main difference between this and the following Phase 1c is the steps. Phase 1b has a single set of steps each side, centered on the walkway in front of the cab door. All later phases has a set of steps on each corner of the frame. The New Haven later reconfigured the frame steps on #0800 as Phase Ic. 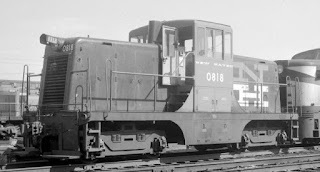 As with all of the DEY-4 locomotives except the final two, #0800 was delivered in Pullman Green with Deluxe Gold simply spelling out New Haven on the cab, with the road number underneath. 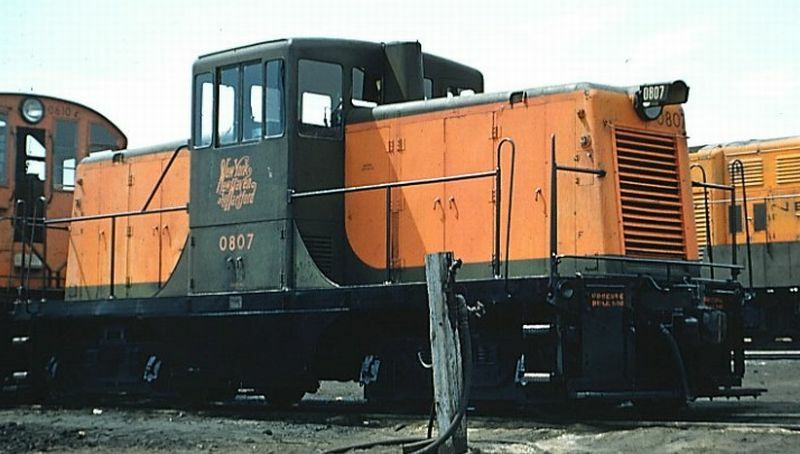 Apparently this was never repainted, and was sold to the Youghiogheny & Ohio Coal Co. in Bridgeport on March 19, 1956, and then sold to a Stratford dealer in July, 1971, still in its original scheme and lettered as New Haven #0800. Note the three small vents on each door on the hood and large radiator shutters at the end of each side. In addition to the door on the nose, there are also sand fill hatches. All of the doors open toward the ends, and there are large generator vents next to the cab. The top of the hood does not have a hatch. Although not visible, the single-chime Wabco A2 horn is centered (from left to right) in front of the stack. The door on the nose is open (or removed?) in this photo. Note the louvered intake on the nose instead of a door. The vents on top of the hood have hinged covers. The radiator shutters have been moved to the nose, and the sand fill hatches relocated to the side at the end. The hood doors are installed in pairs opening in opposite directions. There are small intake vents on the side of the hood above the door closest to the end, and the generator vents are much smaller and between sets of the hood doors. The horn is next to the stack, on the fireman's side. Instead of the vents on top of the hood being protected by doors, the vents had tilting louvres that were controlled from inside the cab. The engine intake vents above the first door are longer, but not as tall as Phase III. 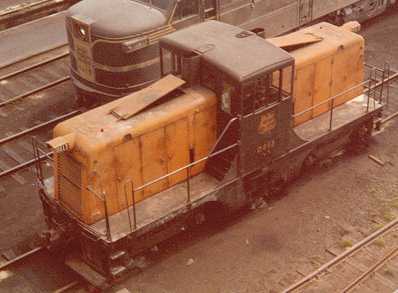 Otherwise this is visually identical to the Phase III locomotives. *The information in the original article was compiled by Allen Copeland and Dan Dover, with help from Ken Ardinger, Ray Corley, John Baskin Harper, Tom Lawson, Tom Nelligan, Joe Strapac, Bill Volkmer, and Raymond L Waye.